We’ll explore the ins and outs of Canvas in this article, demonstrating what is possible with examples and links. In basic terms it’s a very simple pixel-based drawing API, but used in the right way it can be the building block for some clever stuff. What Tools Are at Your disposal? 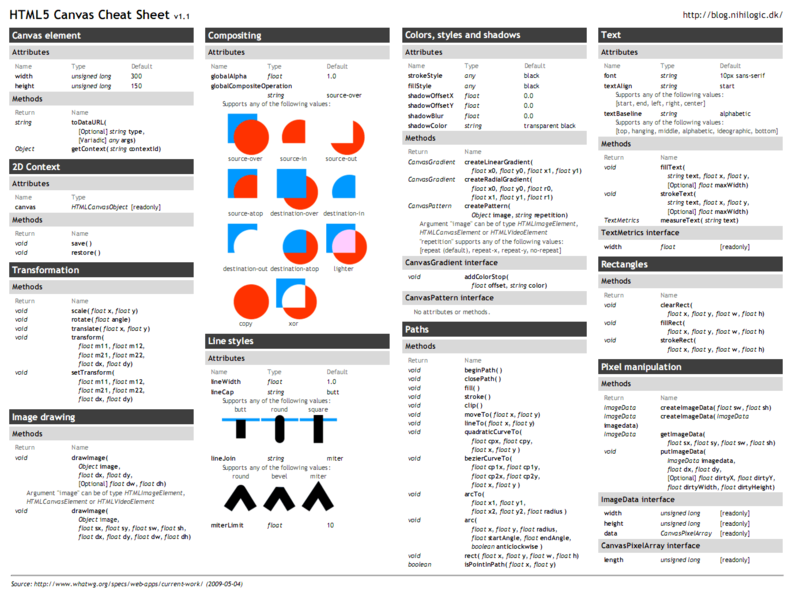 This excellent Canvas cheat sheet is a great reference of the commands available. The Canvas tag is basically an img tag without any data. You specify a width and a height for the drawing area. Instead of an alt attribute, you can enclose HTML within the canvas tag itself for alternative content. Checking for the getContext() method on a canvas DOM object is the standard way of determining canvas compatibility. The context variable now references a Canvas context and can be drawn on. So, let’s get started with an example to demonstrate the basics. We’re going to draw a smiley face, similar to the one on the Acid2 reference rendering. A circle, with a black stroke and yellow fill for the face. 2 circles with a black stroke and white fill and with an inner circle of filled green for the eyes. A curve for the smile. A diamond for the nose. You can see from the above that we start by defining some colours for the stroke and fill, then we create a circle (an arc with a radius of 50 and rotated through the angles of 0 to 2*Pi radians). Finally, we apply the stroke and fill that has been defined previously. We’re going to give the image a red frame. For this we’ll use a rectangle and fill it with a radial gradient to give it a bit of texture. To make our portrait look like it’s hung on a wall, we’ll add a drop shadow and rotate the image slightly so it looks at a slight angle. A drop shadow will need to be applied to the frame. To rotate the canvas, we use the rotate() method which takes a value in radians to rotate the canvas by. This only applies rotation to subsequent drawing to the canvas, so make sure you’ve put this in the right place in your code. Fonts need to be converted for use in Cufon using the tools on the Cufon homepage. 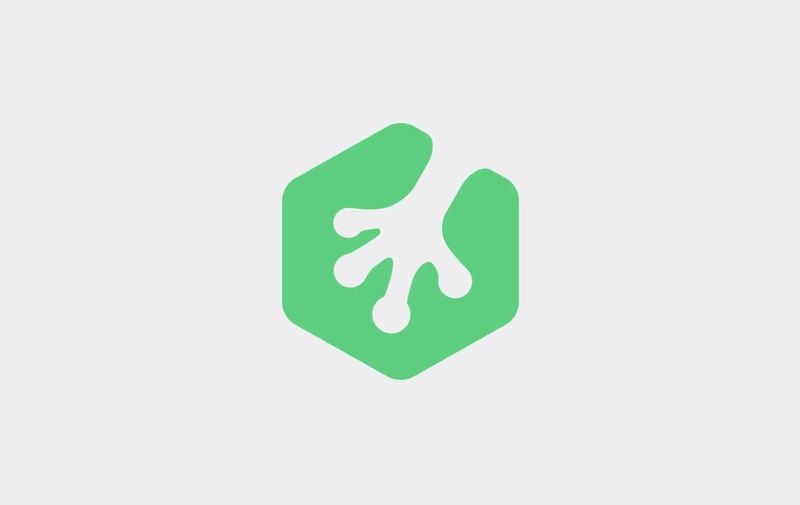 Can’t wait for CSS3 support and want to add rounded corners, gradients or opacity without creating lots of images? Projects like jqcanvas add canvas tags behind standard HTML elements to add design to your web page. ExplorerCanvas even extends canvas support to IE6, although it’s not perfect so don’t expect it to render as well as modern browsers that support canvas natively. Canvas isn’t currently thought of as accessible as there is no mark-up generated or API for textual content to be read. Fallback HTML can be added manually inside the canvas tag, but this will never be good enough to represent the canvas in an accessible way. Thinking About HTML 5 Canvas Accessibility by Steve Faulkner explains the problems in more detail. There is now a general consensus that accessibility needs to be addressed which has lead to the Protocols and Formats Working Group at the W3C recently opening a discussion into proposals for adding accessibility for Canvas with input from others. However, what Canvas has going for it, that SVG doesn’t, is that it can integrate with our existing web pages very easily. We can also work with canvas in much the same way we work with images in web pages. By looking at the few examples in this article, we can get an idea of the variety of situations that Canvas can be applied to. Although the syntax may be frustrating, Canvas gives us drawing technology that we can use right away to enhance our pages. Please give your thoughts, link to further examples or any feedback below. Most of the Chrome Experiments. I use creately to create or draw diagrams. Its an online diagram software that supports real-time collaboration. A great free online tool for generating HTML Canvas scripts by drawing. You can use it for easy learning and developing Canvas elements. it is long winded i suppose but more can be done with the elemnts in a similar way to flash. I know that I am reading this as at Feb 2011, but it is still (if not more) relevant. its good. we wait visit us..
It’s really more useful article to Draw with HTML 5 Canvas. Another great resource for HTML5 Canvas tutorials is, go figure, http://www.html5canvastutorials.com. It has a great set of tutorials to teach you everything you need to know about the HTML5 canvas from A – Z. Hey its really useful post..thanks some time i just use HTML…. Wow its really a very helpful tutorial for me. I like this great learning post. Keep it up.Nice learning blog. I’m an artist. My brain doesn’t work this way. Wouldn’t it be easier to have a GUI application such as Flash where you simply click on a circle icon from the tool palette and just draw the friggen circle. Now it will take me 3 or 4 times as long to do anything. Nice tutorials. Thanks for sharing. Definitely loads to learn I’m fairly new and the more I learn the more I need to learn : ) Thanks again. HTML5 help us to make and arrange our blog so it’s nice stuff. I know I have a lot of catching up to do. Do I have to learn html or can I just skip to HTML 5?? nice! I might change few site features and apply HTML 5 tech. Great!. What about Compatiblity for HTML 5? Will HTML5 Revolutionize The Web Experience? Just one suggestion – the “get yourself a real browser ;-)” message could be styled so it shows on the black background. Wow that is very cool. Thank you very much for the tutorial. I am very bad with image manipulation and creation so this well definitely help. It’ll take some practice but I know I can get better. I’m a cartoonist and will find it extremely hard to ‘code’ my drawings. Will there be an authoring tool like Flash for HTML5? Or does everything literally have to be hand coded. Artistic people and people who have a head for coding are two completely different brains. you should not use that ie code it does not work corretly you should try using the google chrome iframe all you need is a single meta tag and if you want you can add smail script that will saw we have it dont show this frame and it works lots better. I have done few image manipulation with CSS3. Now I will try to do with HTML 5 Canvas. Nice tutorials. Thanks for sharing it. VMware is expected to become essential and more popular as databases and applications evolve along with different operating systems. With the data compression and flexiblity of pendrives it will seemingly develop as a valuable developer for the simple formation of a virtual machine surrounding. Hi…good post guys…thanks for sharing..
All the image manipulation you did in your example can be done with CSS3, box-shadow, transform etc. I think a better example would of been a mini drawing app or showing vector graphics over video. Nice overview! It’s true the syntax is quite clunky, but I’m guessing it’s only a matter of time before we have some mootools-like libraries that make working with canvas a painless endeavor.